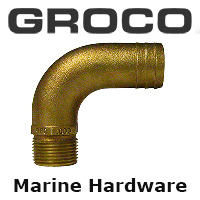 Ancor's NMEA 2000 Approved Backbone Cables offer connection to an NMEA 2000 tee connector. The yellow couplers connect to the corresponding Ancor tees creating a simplified, color coded network installation. The backbone cables are available in four lengths from 0.5 meter (1.6 feet) to 10 meters (32.8 feet) to cover a wide variety of applications.